Atradius acknowledges the importance of good corporate governance. The Governance Principles that were drawn up by the Dutch Association of Insurers outline principles for Dutch insurance companies in terms of corporate governance, risk management, audit and remuneration and are applied by Atradius. Also, the Management Board undersigned the Declaration on moral and ethical conduct. I declare that I will perform my duties as an insurer with integrity and care. I will carefully consider all the interests involved in the insurance company, i.e. those of the clients, the shareholders, the employees and the society in which the company operates. I will give paramount importance to the client’s interests and inform the client to the best of my ability. I will comply with the laws, regulations and codes of conduct applicable to me as an insurer. I will observe secrecy in respect of matters entrusted to me. I will not abuse my insurance knowledge. I will act in an open and assessable manner and I know my responsibility towards society. I will endeavour to maintain and promote confidence in the insurance sector. In this way, I will uphold the reputation of the insurance profession. At the heart of our operation is our customer focus. We are proud to lead the sector in this area. For example, we were the first to introduce Global services targeted at the unique needs of multinational organisations. Today our customer-centric leadership can be seen in our Customer Service Charter, where we commit to the highest levels of customer service and response. I’m very glad that Atradius involved us as a customer in the development of this tool. You often only need to understand which five or ten per cent of information you really need to focus on, and this tool helps me to do that. Our dedication to developing the best tools to support our clients makes us world leaders in credit insurance innovation. Our commitment to innovation is a key area of our operational strategy. Our latest tool, Atradius Insights, sets a new standard within the credit insurance industry for credit management. At Atradius, we want to go beyond credit insurance. We want to provide our customers with insight into their risk. 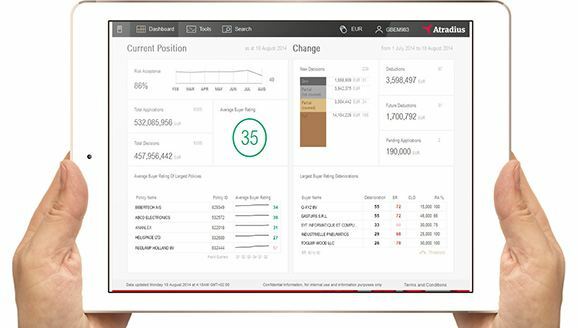 As an online business intelligence tool, Atradius Insights allows clients to identify current and future risks and monitor portfolio performance. This includes drill down options from a main dashboard to provide in depth levels of detail, sophisticated filter options and the ability to export selected data. Specific tools include the ability to show all credit limit decision issued during a selected timescale distributed across your customer ratings bands. It also provides you with an overview of any credit limit decisions that may be scheduled to expire or be withdrawn within the next 12 months. Atradius represents much more than insurance. We build personal relationships with our customers and their buyers to better understand their businesses and provide a more detailed insight into their credit risks. Our Management Board’s membership is a good reflection of our international focus at Atradius. The five senior leaders are Spanish, German, Dutch and French. They’re recognised among their peers as leading voices in the credit insurance sector, with several having worked their way through the business and understanding it in great detail from the ground up. At the heart of our strategy is a desire to create an enduring business with sustainable revenue growth and a secure, stable increase in profits which comprehensively meets our stakeholder and customer needs, irrespective of the size or scope of their business. In addition to a customer-focus and commitment to innovation, our strategy is to strengthen our competitive position and reduce profit volatility, through maximizing cost efficiencies.